Die Erfindung betrifft die Verwendung von resorbierbaren Blockcopolymeren mit Polyether- und Polyestereinheiten zur Herstellung von chirurgischen Implantaten, die für den menschlichen oder tierischen Organismus geeignet sind, und diesbezügliche Blockcopolymere. The invention relates to the use of absorbable block copolymers with polyether and polyester units for the production of surgical implants, which are suitable for human or animal organism, and related block copolymers. Die erfindungsgemäß verwendeten und erfindungsgemäß neuen Blockcopolymere zeichnen sich durch hohe mechanische Festigkeit und schnelle Resorptionskinetik aus. The block copolymers used in the invention and the invention new distinguished by high mechanical strength and rapid absorption kinetics. Die vorliegende Erfindung betrifft resorbierbare Blockcopolymere mit Polyether- und Polyestereinheiten, im Weiteren Poly(etherester) genannt und deren Verwendung zur Herstellung von chirurgischen oder therapeutischen Implantaten für den menschlichen oder tierischen Organismus. The present invention relates to absorbable block copolymers with polyether and polyester units, hereafter referred to as poly (ether-ester) and their use for the manufacture of surgical or therapeutic implants for human or animal organism. Die erfindungsgemäßen Blockcopolymere und daraus hergestellte Implantate zeichnen sich durch eine verbesserte Resorptionskinetik bei gleichzeitig hoher mechanischer Festigkeit aus. The block copolymers of the invention and implants prepared therefrom are characterized by an improved absorption kinetics at the same time high mechanical strength. Im Rahmen der Erfindungsbeschreibung wird auf die Herstellung und die Reinigung der erfindungsgemäßen Blockcopolymere eingegangen. As part of the description of the invention will be discussed in the production and purification of the novel block copolymers. Resorbierbare Polymere gewinnen zunehmend als Additive in pharmazeutischen Formulierungen oder in bioabbaubaren Implantaten an Bedeutung. Absorbable polymers are gaining increasing as additives in pharmaceutical formulations or in biodegradable implants in importance. Für die verschiedenen technischen Bereiche werden Polymere mit deutlich unterschiedlichen physikalischen und chemischen Eigenschaften benötigt. For the various technical areas polymers with significantly different physical and chemical properties are needed. So werden als Additive für pharmazeutische Formulierungen ua Blockpolymere mit Polyester- und Polyethereinheiten als Trägermaterialien für Wirkstoffe oder als Materialien für die Mikroverkapselung von Wirkstoffen verwendet. To be used as carrier materials for active substances or as materials for the microencapsulation of active substances as additives for pharmaceutical formulations among others block copolymers with polyester and polyether. In diesem Fall werden die Polymere bevorzugt über den parenteralen Applikationsweg zugeführt. In this case, the polymers are preferably fed via the parenteral route of administration. Im Fall von Trägermaterialien setzt diese Art der Verwendung voraus, dass die Materialien entweder als Pulver, in Lösung oder in Suspension mit den anderen Formulierungskomponenten ohne Qualitätsverluste vermischt werden können. In the case of carrier materials this type of use requires that the materials can be mixed either as a powder, in solution or in suspension with the other formulation components without loss of quality. Für Mikroverkapselungen gilt ebenfalls, dass das verwendete Polymer sich gegenüber den weiteren Formulierungsbestandteilen chemisch und physikalisch neutral verhält. For microencapsulation also that the polymer used behaves chemically and physically neutral towards the other formulation components applies. Eine weitere Anforderung besteht darin, dass die Mikrokapsel am Zielort den Wirkstoff freisetzt. Another requirement is that the microcapsule releases the active ingredient at the target site. Naturgemäß scheiden spröde oder feste Materialien in diesen Anwendungen aus. Naturally, separate or brittle solid materials in these applications. In diesem Bereich haben sich ua Poly(etherester) vom AB-Typ, ABA-Typ, BAB-Typ, ABABABAB-Typ als geeignet erwiesen. In this area, ABABABAB type have, inter alia, poly (ether-ester) of the AB type, ABA type, BAB type proved to be suitable. Als Beispiele seien Polymere mit L- oder D,L-Lactid für den A Block und Polyethylenglycol für den B Block genannt. As examples of polymers with L- or D, L-lactide which may be mentioned for the A block and polyethylene glycol for the B block. Neben der Verwendung für den pharmazeutischen Bereich rücken resorbierbare Polymere zunehmend auch in der Chirurgie und chirurgischen Therapie in das Interesse der Fachleute. Besides the use for the pharmaceutical sector resorbable polymers move increasingly in surgery and surgical therapy in the interest of professionals. Bei der Auswahl der in diesem Bereich als geeignet erscheinenden Materialien müssen neben toxikologischen Eigenschaften im Gegensatz zu den pharmazeutischen Verwendungen gerade die mechanischen Eigenschaften der Materialien berücksichtigt werden. In the selection of in this area appears to be suitable materials just the mechanical properties of materials must be considered in addition to toxicological properties as opposed to the pharmaceutical uses. Hier kommen feste Materialien zum Einsatz, die einerseits dem toxikologischen und mechanischen Anforderungsprofil Genüge tun, aber auch Eigenschaften, die für die Herstellung und Verarbeitung notwendig sind. Here, solid materials are used, on the one hand do the toxicological and mechanical requirements sufficiently, but also properties that are necessary for the production and processing. So sollen die Materialien zugänglich sein für thermoplastische Verarbeitungsverfahren, wie Spritzguss, Schmelzpressen, Extrusion oder den Anforderungen von mechanischen Methoden wie spanabhebende Verfahren standhalten. Thus, the materials should be accessible for thermoplastic processing methods such as injection molding, melt pressing, extrusion, or the requirements of mechanical methods such as machining methods withstand. Die diesbezüglich wesentlichen Eigenschaften sind hauptsächliche Festigkeit bei Zug- oder Biegebeanspruchung, sowie die Degradationsgeschwindigkeit. In this respect essential properties are primary strength at tensile or bending stress, as well as the degradation rate. Die Eigenschaften eines Implantates werden vornehmlich durch den verwendeten Werkstoff bestimmt und weniger durch seine Verarbeitung. The properties of an implant to be mainly determined by the material used and less by its processing. Die resorbierbaren Implantate bieten gegenüber nichtresorbierbaren Materialien wie Metallen den Vorteil, dass sie nach Funktionserfüllung vom menschlichen oder tierischen Körper hydrolytisch abgebaut werden und die Abbauprodukte vom Körper resorbiert werden. The absorbable implants offer advantages over non-resorbable materials such as metals the advantage that they are degraded by hydrolysis of functional performance of the human or animal body and the degradation products are absorbed by the body. Eine Entfernung des Implantats im Rahmen einer Zweitoperation ist somit nicht erforderlich. Removal of the implant during a second surgery is not required. Ein weiterer Vorteil der resorbierbaren Implantate besteht z. Another advantage of the absorbable implants consists, for. B. in der besseren Verträglichkeit der Materialien, wie sich am Beispiel der Osteosynthese zeigt, wo bei nicht-resorbierbaren Implantaten die Gefahr einer Inaktivitätsatrophie des Knochens besteht, was zu einer erhöhten Gefahr einer erneuten Fraktur des Knochens nach Implantatentfernung führen kann. As in the better compatibility of the materials, as demonstrated by the example of osteosynthesis, where the risk of disuse atrophy of the bone is in non-resorbable implants, which can lead to implant removal to an increased risk of another fracture of bone. Die für chirurgische Zwecke interessanten Polymere sollten neben der Resorptionsfähigkeit auch andere Eigenschaften wie hohe Festigkeit aufweisen. The interesting for surgical purposes in addition to the polymers should have resorption and other properties such as high strength. Bekannte resorbierbare Polymere, die sich für chirurgische Implantate u.ä. Known resorbable polymers etc. for surgical implants eignen, sind beispielsweise aliphatische Poly(ester) auf der Basis von Lactid (= 3,6-Dimethyl-1,4-dioxan-2,5-dion), Glycolid (= 1,4-Dioxan-2,5-dion), Dioxanon (1.4-Dioxan-2-on), Copolymere aus Lactid/Glycolid mit Trimethylencarbonat (= 1.3-Dioxan-2-on) und epsilon-Caprolacton. suitable are, for example, aliphatic poly (ester) based on lactide (= 3,6-dimethyl-1,4-dioxane-2,5-dione), glycolide (= 1,4-dioxane-2,5-dione) , dioxanone (1,4-dioxan-2-one), copolymers of lactide / glycolide with trimethylene carbonate (= 1.3-dioxan-2-one) and epsilon-caprolactone. Hierbei werden bevorzugt Vertreter mit hohen Molekulargewichten verwendet. Here representatives are preferably used with high molecular weights. Als Beispiele werden genannt: Poly(L-lactid), Poly(D,L-lactid), Poly(L-lactid-co-D,L-lactid), Poly(D,L-lactid-co-glycolid), Poly(glycolid), Poly(L-lactid-co-glycolid), Poly(glycolid-co- trimethylencaronat), Poly(L-lactid-co-trimethylencarbonat), Poly(D,L-lactid-co-trimethylencarbonat), Poly(L-lactid-co-caprolacton). Examples include: poly (L-lactide), poly (D, L-lactide), poly (L-lactide-co-D, L-lactide), poly (D, L-lactide-co-glycolide), poly (glycolide), poly (L-lactide-co-glycolide), poly (glycolide-co- trimethylencaronat), poly (L-lactide-co-trimethylene carbonate), poly (D, L-lactide-co-trimethylene carbonate), poly ( L-lactide-co-caprolactone). Mit den vorstehend genannten Werkstoffen lassen sich resorbierbare Implantate herstellen, welche in ihren mechanischen Eigenschaften ein weites Spektrum abdecken. With the above-mentioned materials to resorbable implants can be produced, which cover a wide spectrum in their mechanical properties. Beispielsweise weist Poly(L-lactid) bei einer hohen Festigkeit auch eine große Steifigkeit und Sprödigkeit auf, während sich durch Copolymerisation von D,L-Lactid und Trimethylencarbonat Werkstoffe mit zähelastischen Eigenschaften herstellen lassen. For example, poly comprises (L-lactide) with a high strength and a high rigidity and brittleness, while is possible to produce materials with viscoelastic properties by copolymerizing D, L-lactide and trimethylene carbonate. Aufgrund einer Abbaugeschwindigkeit von einigen Monaten bis mehreren Jahren eignen sich diese Werkstoffe besonders für Implantate, die entsprechend lang im Körper verbleiben sollen. Due to a degradation rate of a few months to several years, these materials are particularly suited for implants which are to remain sufficiently long in the body. Andererseits besteht in der Chirurgie häufig ein bisher nicht befriedigter Bedarf für schneller degradierbare Werkstoffe und Implantate. On the other hand, in surgery often a previously unmet need for faster degradable materials and implants. Insbesondere für pädiatrische Applikationen und für Implantate zur Fixierung von schnell proliferierendem Gewebe werden Werkstoffe benötigt, welche vergleichsweise schnell abgebaut werden, aber dennoch die notwendigen mechanischen Eigenschaften wie Festigkeit, Elastizität, Zähigkeit usw. aufweisen. Materials are needed especially for pediatric applications and for implants for fixing fast proliferating tissue which are relatively rapidly degraded, but the necessary mechanical properties as strength, elasticity, toughness, etc.. Die vorliegende Erfindung leistet einen Beitrag zur Bereitstellung solcher Werkstoffe. The present invention contributes to the provision of such materials. Es wurde nämlich überraschend gefunden, dass durch ringöffnende Polymerisation von cyclischen Estern in Gegenwart von mono- oder difunktionalem Poly(ethylenglycol) bei gemäßigten Synthesebedingungen hochmolekulare Blockcopolymere vom AB- oder ABA-Typ in einem einfachen, industriell anwendbarem Maßstab herzustellen sind, die geeignet sind, daraus Implantate mit verbesserten Eigenschaften herzustellen. It has been found, surprisingly, that are to be produced in a simple, industrially applicable scale at moderate conditions of synthesis, high molecular weight block copolymers of the AB or ABA type by ring-opening polymerization of cyclic esters in the presence of mono- or difunctional poly (ethylene glycol), which are suitable it produce implants with improved properties. Diese Polymere sind zudem auch im industriellen Maßstab in einfacher Form zB durch Extraktionsverfahren zu reinigen, so dass ihr Reinheitsgrad den Anforderungen für eine Implantation in den Körper genügt. These polymers are also cleaned on an industrial scale in a simple form, for example, by extraction processes, so its purity meets the requirements for implantation in the body. Daneben weisen sie Eigenschaften auf, die es erlauben, die Materialien über einfache thermoplastische Formgebungsmethoden zu Implantaten zu verarbeiten. They also have properties that make it possible to process the materials simple thermoplastic shaping methods implants. Aufgabe der vorliegenden Erfindung ist es, Werkstoffe zur Herstellung von medizinischen und chirurgischen Implantaten bereit zu stellen, die gegenüber den aus dem Stand der Technik bekannten Werkstoffen schneller vom menschlichen oder tierischen Organismus abgebaut werden, gleichzeitig jedoch eine hohe mechanische Festigkeit, wie beispielsweise Zugfestigkeit aufweisen. Object of the present invention is to provide materials for the production of medical and surgical implants ready to be compared to the processes known from the prior art materials rapidly degraded by the human or animal organism, at the same time, however, a high mechanical strength, such as for example, have tensile strength. Eine weitere Aufgabe besteht darin, Werkstoffe zur Herstellung von medizinischen und chirurgischen Implantaten bereit zu stellen, die die für Implantate geeigneten physikalischen Eigenschaften besitzen. Another object is to provide materials for the manufacture of medical and surgical implants available that have the appropriate implants for physical properties. Dazu können beispielsweise initiale Festigkeit, Elastizität oder Zähigkeit zählen. These initial strength, elasticity or toughness may include, for example. Eine weitere Aufgabe der Erfindung besteht darin, die erfindungsgemäßen Werkstoffe in einem Reinheitsgrad zur Verfügung zu stellen, welcher die Anwendung im menschlichen oder tierischen Körper gestattet. A further object of the invention is to provide materials of the invention in a purity grade available, which allows the use in the human or animal body. Dabei wird insbesondere auf einen geringen Gehalt an Syntheseausgangsstoffen in dem fertigen Werkstoff Wert gelegt. In this case, in particular, set to a low content of synthetic raw materials in the finished material value. Eine weitere Aufgabe der Erfindung besteht darin, Materialien für chirurgische Implantate bereit zu stellen, welche schnell genug resorbiert werden, um in pädiatrischen Applikationen oder als Implantate zur Fixierung von schnell proliferierendem Gewebe verwendet werden zu können. Another object of the invention is to provide materials for surgical implants available which are absorbed quickly enough to be used in pediatric applications or as implants for fixing fast proliferating tissue to. Eine weitere Aufgabe der Erfindung ist es, ein industriell anwendbares Verfahren zur Herstellung von Rohstoffe für die og Implantate zur Verfügung zu stellen. Another object of the invention is to provide an industrially applicable process for the production of raw materials for the above implants available. Gegenstand der Erfindung sind Blockpolymere aus Polyestereinheiten und Polyethereinheiten zur Herstellung von resorbierbaren, chirurgischen Implantaten. The invention relates to block polymers of polyether and polyester units for the preparation of absorbable surgical implants. Unter dem Begriff Implantat wird ein Formkörper verstanden, der chirurgisch wie auch mechanisch zur Einbringung in den menschlichen oder tierischen Organismus geeignet ist und toxikologisch unbedenklich ist. The term implant a shaped body is understood, which is also suitable as surgical mechanically for introduction into the human or animal organism and is toxicologically harmless. Derartige Formkörper können sein: Schrauben, Dübel, Platten, Muttern für Schrauben, Anker, Vliese, Folien, Membrane, Netze usw. Sie können eingesetzt werden zur Fixation von Hartgewebefrakturen, als Nahtmaterialanker, als Wirbelsäulenimplantat, zum Verschließen und Verbinden von Blut- und anderen Gefäßen, als Stent, zum Verfüllen von Kavitäten oder Löchern bei Gewebedefekten usw. Such shaped bodies can be: screws, plugs, plates, nuts for bolts, anchors, nonwovens, films, membranes, networks, etc. They can be used for the fixation of hard tissue fractures, as a suture anchor, as spinal implant for closing and joining of blood and other vessels, as a stent, for filling cavities or holes in tissue defects, etc. Die erfindungsgemäß verwendeten Blockpolymere sind Polyetherester vom AB-Typ bzw. ABA-Typ. The block polymers used in this invention are polyether AB type or ABA type. Dabei steht A für einen Polymerblock mit wiederkehrenden Estereinheiten und B für einen Polymerblock mit wiederkehrenden Ethereinheiten. Here, A represents a polymer block containing recurring Estereinheiten and B is a polymer block containing recurring ether units. Der Polyesterblock A besteht aus n Bausteinen, die formal auf eine oder mehrere Hydroxycarbonsäuren oder ein Carbonat zurückgehen, bevorzugt eine alpha-Hydroxycarbonsäure. The polyester block A is composed of n blocks, the back formal one or more hydroxycarboxylic acids or a carbonate, preferably an alpha-hydroxycarboxylic acid. Ggf. Possibly. kann sich ein Block A formal auch aus mehreren verschiedenen dieser Bausteine aufbauen. a block can build A formal also from several different these building blocks. Der Buchstabe B steht für eine Polyethereinheit, deren Repetiereinheiten sich formal aus Ethylenglycol ableiten. The letter B is a polyether whose repeating units formally derived from ethylene glycol. Die Repetiereinheiten können m-fach vorhanden sein. The repeating units may be m times available. Die erfindungsgemäßen Polymere werden hergestellt, indem an einem Polyethylenglycolblock B mit ein oder zwei freien endständigen OH-Gruppen der oder die Polyesterblöcke A aufgebaut werden. The inventive polymers are prepared by be constructed on a Polyethylenglycolblock B with one or two free terminal OH groups of the polyester blocks or A. Für Polymere des ABA Typs werden dementsprechend Polyethylenglycolblöcke mit zwei endständigen OH-Gruppen verwendet, für Polymere des AB Typs Polyethylenglycolblöcke mit nur einer endständigen OH-Gruppe. For polymers of the ABA type polyethylene glycol blocks are used having two terminal OH groups accordingly, for polymers of the type AB polyethylene glycol blocks with only one terminal OH group. Die Struktureinheit E-(-OD-CO-) n - bildet den Block A. The structural unit E - (- OD-CO-) n - constitutes the block A. Der Block A ist über eine kovalente Bindung mit dem Block B verknüpft. The block A is linked via a covalent bond with the B block. Die Struktureinheit -(O-CH 2 -CH 2 -) m -OF bildet den Block B. The structural unit - (O-CH 2 -CH 2 -) m -OF forming the block B.
Es sei ausdrücklich darauf hingewiesen, dass AB-Blockpolymere strukturgleich mit BA-Blockpolymeren sind, weshalb im Rahmen dieser Erfindungsbeschreibung diesbezüglich keine Differenzierung vorgenommen wird. It is expressly noted that AB block polymers are structurally identical to BA block polymers, and therefore in this respect no distinction is made in the context of this invention description. Wie bei Polymeren üblich handelt es sich bei der Angaben n, n' und m um Zahlen, die die statistisch gemittelte Kettenlänge der beiden Blöcke beschreiben. common is, as in polymers in which the data n, n 'and m are numbers that describe the statistically average chain length of the two blocks. Die genauen Zahlen in jedem Einzelmolekül unterliegen einer statistischen Verteilung. The exact numbers in each molecule are subject to a statistical distribution. Die Länge des B-Blocks in den Copolymeren kann im Mittel zwischen 500 und 10000 Dalton liegen. The length of the B block in the copolymers may be in the means 500 to 10,000 daltons. Bevorzugt ist eine gemittelte Blocklänge zwischen 600 und 8000 Dalton, besonders bevorzugt eine gemittelte Blocklänge zwischen 1000 und 8000 Dalton. is preferably an average block length from 600 to 8000 Dalton, particularly preferably an average block length of 1000 to 8000 Dalton. An dieser Stelle sei darauf hingewiesen, dass alle in dieser Beschreibung genannten Intervallsangaben jeweils die Randwerte mit einschließen. It should be noted that all interval data referred to in this description, each including the marginal values. Das gewichtsmäßige Verhältnis vom A- zum B-Block spielt eine wesentliche Rolle für die Eigenschaften der Copolymere und der hieraus hergestellten erfindungsgemäßen Implantate. The weight ratio even from A- to B-block plays an important role for the properties of the copolymers and of the implants of the invention produced. Je größer der Anteil an B-Block, desto hydrophiler ist der Werkstoff, was positive Effekte im Hinblick auf eine schnelle Resorbierbarkeit (Hydrolyse- oder Abbaugeschwindigkeit) begründet. The larger the fraction of B block, the more hydrophilic the material is what establishes positive effects in terms of rapid absorbability (hydrolysis or degradation speed). Erfindungsgemäß liegt der gewichtsmäßige Anteil des B-Blocks zwischen 0,01 und 25 %. According to the invention the percentage by weight of the B block is between 0.01 and 25%. Die nachstehende Reihenfolge gibt mit steigernder Priorität die für die einzelnen Ausbildungsformen bevorzugten Anteil an B an: 0,01 bis 20 %, 0,1 bis 15 %, 0,1 bis 10 %, 0,1 bis 5 %, 0,1 bis 4 %. The following order is preferred with-increasing priority for the individual embodiments proportion of B to 0.01 to 20%, 0.1 to 15%, 0.1 to 10%, 0.1 to 5%, 0.1 to 4%. Besonders bevorzugt sind Polymere mit den beiden zuletzt genannten Anteilen an B. Es wurde nämlich überraschenderweise gefunden, dass bei diesen Ausführungsformen mit nur geringen Anteilen des hydrophilen B-Blocks der hydrolytische Abbau gegenüber den entsprechenden reinen Polyestern) deutlich beschleunigt wird. Particularly preferred are polymers with the two last-mentioned amounts of B. It is has surprisingly been found that, in these embodiments, the hydrolytic degradation compared to the corresponding pure polyesters) is clearly accelerated with only small proportions of the hydrophilic B block. Am stärksten bevorzugt sind Polymere mit einem Anteil an B von 0,1 bis 4 Gew.%. Most preferred are polymers having a fraction of B from 0.1 to 4 are present.%. Dies ist von besonderem Vorteil, da Formkörper, welche ein Blockpolymer mit hoher Dominanz im A-Block enthalten, eine höhere Festigkeit aufweisen. This is of particular advantage, since molded body containing a block polymer having a high dominance in the A block, have a higher strength. Zudem kann ein kürzeres Poly(ethylenglycol)-Fragment, welches durch den hydrolytischen Abbau des Blockpolymeren freigesetzt wird, leicht vom Körper renal ausgeschieden werden. In addition, a shorter poly (ethylene glycol) fragment, which is released by the hydrolytic degradation of the block polymer can be easily excreted from the body renal. Daher sind Ausführungsformen mit einem Anteil von B von 0,5 bis 1,5 Gew.% diesbezüglich bevorzugt. Therefore% embodiments are present in an amount of B of 0.5 to 1.5. In this regard, preferred. Durch die genannten Angaben zur Länge des Blocks B und dessen Gewichtsanteil am Gesamtpolymeren ergeben sich zwangsläufig die Blocklängen des oder der A-Blöcke und damit auch das Gesamtmolekulargewicht. By the above information, the length of the block B and the weight proportion of the total polymers are unavoidable, the block lengths of the, or of the A blocks, and thus also the total molecular weight. Bei Triblockcopolymeren des Typs ABA ist davon auszugehen, dass die Länge und der Gewichtsanteil der beiden Blöcke A im Mittel gleich groß sind. In triblock copolymers of the type ABA is to be assumed that the length and the weight fraction of the two A blocks are the same size on the average. Ebenso wird das Gesamtmolekulargwicht des Copolymeren durch das bei der Synthese eingesetzte Molekulargewicht des Ethylenglycols und das Einsatzverhältnis beider Komponenten festgelegt. Likewise, the Gesamtmolekulargwicht of the copolymer is determined by the molecular weight used in the synthesis of ethylene glycol and the use ratio of the two components. An dieser Stelle wird darauf hingewiesen, dass naturgemäß auch über die Länge und den Anteil des Blocks B das Molekulargewicht des finalen Blockpolymers maßgeblich mitbestimmt werden kann. At this point it should be noted that naturally the molecular weight of the final block polymer can be significantly influenced over the length and the proportion of the block B.
Als weiterer wichtiger Parameter für die Charakterisierung der für die erfindungsgemäße Verwendung geeigneten Polymere kann die inhärente Viskosität (iV) herangezogen werden. Another important parameter for the characterization of the suitable for use in the invention polymers, the inherent viscosity (IV) can be used. Die inhärente Viskosität der Blockpolymere kann in einem weiten Bereich variiert werden. The inherent viscosity of the block polymers can be varied in a wide range. Bevorzugt wird eine inhärente Viskosität (gemessen in einem Ubbelhode-Viskosimeter in Chloroform bei 25 °C in 0,1 prozentiger Lösung) zwischen 0,1 und 6 dl/g, bevorzugt zwischen 0.5 und 5 dl/g. an inherent viscosity is preferred (as measured in an Ubbelhode viscosimeter in chloroform at 25 ° C in 0.1 percent solution) between 0.1 and 6 dl / g, preferably between 0.5 and 5 dl / g. Besonders bevorzugt sind Werte zwischen 0,6 und 3 dl/g und insbesondere bevorzugt sind Werte zwischen 0,7 und 2,75 dl/g. Particularly preferred are values ​​of 0.6 to 3 dl / g and particularly preferred are values ​​of 0.7 to 2.75 dl / g.
– Die inhärente Viskosität (gemessen in Chloroform bei 25 °C in 0,1 prozentiger Lösung) liegt zwischen 0,1 und 5,5 dl/g, bevorzugt zwischen 0,5 und 5,0 dl/g. - (measured in chloroform at 25 ° C in 0.1 percent solution) The inherent viscosity is between 0.1 and 5.5 dl / g, preferably between 0.5 and 5.0 dl / g.
– Die mittlere Blocklänge im B-Block liegt zwischen 1000 und 8000 Dalton. - The average block length in the B block is from 1000 to 8000 daltons. – Gemische aus statistisch verteiltem (randomisierten) L-Lactid und Glycolid, bevorzugt mit einem molarem Anteil L-Lactid zwischen 70 und 95 %. - mixtures of randomly distributed (randomized) L-lactide and glycolide, preferably with a molar proportion L-lactide between 70 and 95%. – Gemische aus statistisch verteiltem (randomisierten) D,L-Lactid und Glycolid, bevorzugt mit einem molarem Anteil D,L-Lactid zwischen 50 und 80 %. - mixtures of randomly distributed (randomized) D, L-lactide and glycolide, preferably with a molar proportion of D, L-lactide between 50 and 80%. – Gemische aus statistisch verteilten (randomisierten) L-Lactid oder D,L-Lactid und epsilon-Caprolacton-Einheiten. - mixtures of randomly distributed (randomized) L-lactide or D, L-lactide and epsilon-caprolactone units. – Gemische aus statistisch verteilten (randomisierten) L-Lactid oder D,L-Lactid und Dioxanon-Einheiten. - mixtures of randomly distributed (randomized) L-lactide or D, L-lactide, and dioxanone units. Die erfindungsgemäßen Implantate enthalten bevorzugt einen oder mehrere verschiedene der erfindungsgemäßen Blockpolymere und daneben keine weiteren Additive, es sei denn Verunreinigungen aus dem Polymerisationsprozess. The implants of the invention preferably contain one or more different block polymers of the invention and next to no other additives, unless impurities from the polymerization process. In einer besonderen Ausgestaltungsform können die Implantate auch Blends von hochmolekularen Blockpolymeren mit anderen resorbierbaren Materialien, wie beispielsweise resorbierbare Poly(ester) aus der Gruppe Poly(L-Lactid), Poly(D-Lactid), Poly(D,L-lactid), Poly(meso-lactid), Poly(glycolid), Poly(trimethylencarbonat), Poly(dioxanon), Poly(epsilon-Caprolacton), sowie Copolymere aus den entsprechenden Heterozyklen oder Polyethylenglycol enthalten. In a particular embodiment, the implants also blends of high molecular weight block polymers with other resorbable materials such as, for example, absorbable poly (ester) selected from the group poly (L-lactide), poly (D-lactide), poly (D, L-lactide), poly (meso-lactide), poly (glycolide), poly (trimethylene carbonate), poly (dioxanone), poly (epsilon-caprolactone) and copolymers containing from the corresponding heterocycles or polyethylene glycol. Bevorzugt werden solche Blends, bei denen die chemische Struktur des A-Blocks im Blockpolymeren derjenigen im Poly(ester) entspricht. Such blends, in which the chemical structure of the A block in the block polymer corresponds to that in the poly (ester) are preferred. Hierdurch wird eine gute Phasenankopplung im Blend gewährleistet, was für gute mechanische Eigenschaften vorteilhaft ist. In this way, a good phase connection is ensured in the blend, which is advantageous for good mechanical properties. Auch können Blends aus verschiedenen Blockpolymeren zur Anwendung kommen. Blends of different block polymers can be used. Die erfindungsgemäßen Implantate können ein Gewicht zwischen 1 und 10 000 mg aufweisen, bevorzugt ein Gewicht zwischen 5 und 5 000 mg und besonders bevorzugt ein Gewicht zwischen 10 und 1 000 mg. The implants of the invention can have a weight from 1 to 10,000 mg, preferably has a weight from 5 to 5000 mg, and more preferably a weight from 10 to 1000 mg. Die bevorzugte Zugfestigkeit der Implantate gemessen als Formkörpern gemäß der Norm ASTM D 638, die erfindungsgemäß aus den oben beschriebene Polymeren hergestellt werden, beträgt mindestens 70 MPa, bevorzugt 75 bis 95 MPa, besonders bevorzugt 80 bis 88 MPa. The preferred tensile strength of the implants measured as moldings according to the standard ASTM D 638, which are manufactured according to the invention from the above-described polymers is at least 70 MPa, preferably 75 to 95 MPa, particularly preferably 80 to 88 MPa. Die bevorzugte Hydrolysegeschwindgkeit (Abbaugeschwindigkeit) der Implantate, bestimmt über die Veränderungen der inhärenten Viskosität an Formkörpern gemäß der Norm ASTM D 638, die erfindungsgemäß aus den oben beschriebene Polymeren hergestellt werden, beträgt in einem Bad aus einem wässrigen Phosphatpuffer mit pH 7,4 bei einer Temperatur von 37°C nach 6 Wochen mindestens 30%, bevorzugt 40% bevorzugt 45% bezogen auf den Ausgangswert. 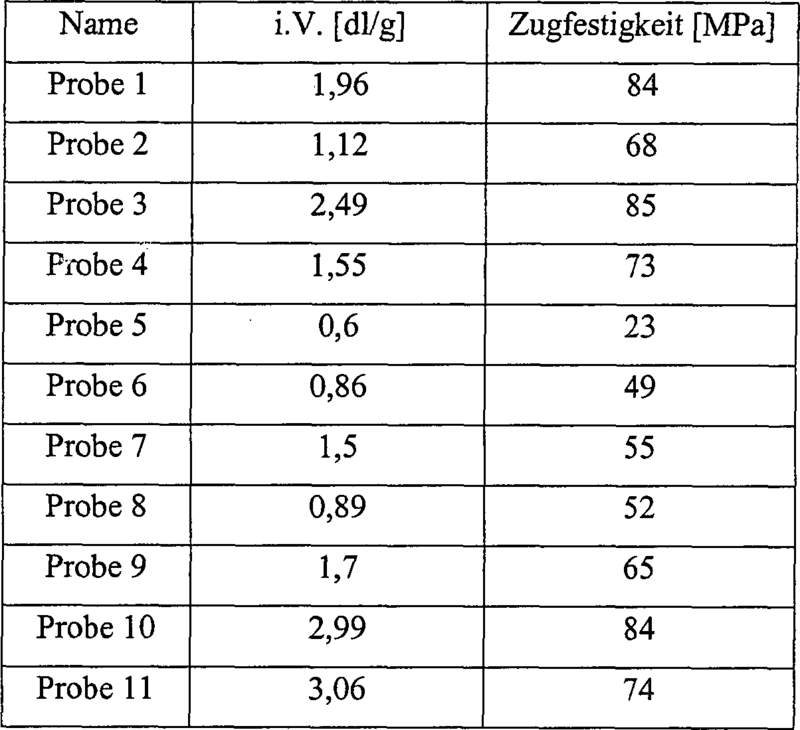 The preferred Hydrolysegeschwindgkeit (degradation rate) of the implants, as determined by the changes of the inherent viscosity of shaped bodies according to the standard ASTM D 638, according to the invention are prepared from the above-described polymers is in a bath of an aqueous phosphate buffer at pH 7.4 at a temperature of 37 ° C after 6 weeks at least 30%, preferably 40% preferably 45% based on the starting value. Copolymere vom AB-Typ können durch ringöffnende Polymerisation von cyclischen Estern in Gegenwart von Poly(ethylenglycol) mit einer freien Hydroxylgruppe und einer nichtreaktiven Endgruppe, bevorzugt sind Methoxy-Endgruppen, synthetisiert werden. Copolymers of the AB type can be prepared by ring-opening polymerization of cyclic esters in the presence of poly (ethylene glycol) having a free hydroxyl end group and a non-reactive, are preferably methoxy end groups, are synthesized. Copolymere vom ABA-Typ können in Gegenwart von Poly(ethylenglycol) mit zwei freien Hydroxylgruppen hergestellt werden. Copolymers of ABA type can be prepared in the presence of poly (ethylene glycol) with two free hydroxyl groups. In diesem Fall werden die beiden Blöcke A im gleichen Syntheseschritt parallel aufgebaut. In this case the two A blocks are constructed in parallel in the same step of the synthesis. Als Bausteine für die ringöffnenden Polymerisation zur Herstellung des Blocks A bzw. der Blöcke A dienen cyclische Ester der allgemeinen Formel III. As building blocks for the ring-opening polymerization for preparing the block A and the blocks A cyclic ester of the general formula III are used. wobei D in jeder der Einheiten -OD-CO unabhängig voneinander eine der oben genannten Definitionen haben kann. wherein D may independently have one of the above definitions in each of the units -OD CO.
z ist eine ganze Zahl und mindestens 1, bevorzugt 1 oder 2. Besonders bevorzugt werden dimere cyclische Ester von alpha-Hydroxycarbonsäuren, monomere Lactone oder cyclische Carbonate verwendet. z is an integer and at least 1, preferably 1 or dimeric cyclic esters of alpha-hydroxycarboxylic acids, monomeric lactones or cyclic carbonates are 2. Most preferably used. Bei der Herstellung des Blocks oder der Blöcke A ist es nicht zwingend, dass nur eine Art von Bausteinen nach Formel III verwendet wird. In the production of the block or blocks A, it is not mandatory that only one type of building blocks is used according to Formula III. Es können auch Gemische verwendet werden, die sich durch die chemische Natur des Strukturelements D unterscheiden. It can be used, which differ in the chemical nature of the structural element D mixtures. Bevorzugte Strukturen nach Formel III, bzw. bevorzugte Moleküle, aus denen die Blöcke A durch ringförmige Polymerisation gebildet werden, sind a) L-Lactid, b) D-Lactid, c) Gemische aus D- und L-Lactid zB racemisches D,L-Lactid, d) meso-Lactid, e) Glycolid, f) Trimethylencarbonat, g) epsilon-Caprolacton, h) Dioxanon, i) Gemische aus L-Lactid und D,L-Lactid, j) Gemische aus L-Lactid und Glycolid, k) Gemische aus D,L-Lactid und Glycolid, l) Gemische aus L-Lactid oder D,L-Lactid und Trimethylencarbonat, m) Gemische aus L-Lactid oder D,L-Lactid und epsilon-Caprolacton. Preferred structures of Formula III, or preferred molecules of which the A blocks are formed by ring-polymerization are a) L-lactide b) D-lactide, c) mixtures of D- and L-lactide, for example, racemic D, L lactide, d) meso-lactide, e) glycolide, f) trimethylene carbonate, g) epsilon-caprolactone, h) dioxanone, i) mixtures of L-lactide and D, L-lactide, j) mixtures of L-lactide and glycolide , k) mixtures of D, L-lactide and glycolide, l) mixtures of L-lactide or D, L-lactide and trimethylene carbonate, m) mixtures of L-lactide or D, L-lactide and epsilon-caprolactone. Für die Herstellung der Poly(etherester) ist es empfehlenswert, die Rohstoffe in einem hohen Reinheitsgrad einzusetzen. For the preparation of the poly (ether-ester) it is advisable to use the raw materials in a high degree of purity. Insbesondere polar-protische Verunreinigungen, wie zB Wasser führen zu einem Kettenabbruch während der Polymerisation. In particular, polar-protic impurities such as water lead to chain termination during polymerization. Aus diesem Grund ist es empfehlenswert, das Poly(ethylenglycol) vor Einsatz in der Polymerisation zu trocknen. For this reason, it is recommended that the poly (ethylene glycol) to be dried before use in polymerization. Für die Synthese wird Poly(ethylenglycol) mit einem oder mehreren der Monomeren bzw. Dimeren nach Formel III gemischt und aufgeschmolzen. For the synthesis of poly (ethylene glycol) is mixed with one or more of the monomers or dimers of formula III and melted. Nachdem die Edukte homogen gemischt sind, wird dann der für die Ringöffnungspolymerisation vorgesehene Katalysator zugegeben. After the reactants are mixed homogeneously, the space provided for the ring-opening polymerization catalyst is then added. Das Reaktionsgemisch wird bevorzugt bei erhöhter Temperatur polymerisiert. The reaction mixture is preferably polymerized at elevated temperature. Für die Synthese eignen sich eine Reihe verschiedener Metallkatalysatoren, wie beispielsweise Zinn- oder Zinkverbindungen. For the synthesis of a variety of metal catalysts, such as tin or zinc compounds are suitable. Bevorzugt werden Zinn(II)chlorid oder Zinn(II)ethylhexanoat. Tin (II) chloride or tin (II) ethylhexanoate are preferred. Im Hinblick auf die vorgesehene Verwendung im menschlichen oder tierischen Organismus ist es vorteilhaft, eine möglichst geringe Menge Katalysator einzusetzen. In view of the intended use in the human or animal organism, it is advantageous to use the smallest possible amount of catalyst. Bevorzugt wird eine Konzentration zwischen 30 und 200 ppm, besonders bevorzugt eine Konzentration zwischen 50 und 100 ppm. a concentration between 30 and 200 ppm, a concentration between 50 and 100 ppm is preferred, particularly preferred. Dabei bezieht sich die Konzentrationsangabe des Katalysators jeweils auf Gewichtsteile des katalysierenden Metallions bezogen auf die gesamte Reaktionsmasse. Here, the concentration of the catalyst specified in each case refers to parts by weight of the catalyzing metal ion based on the total reaction mass. Die Reaktionstemperatur liegt oberhalb der Schmelztemperatur der jeweils eingesetzten Edukte und richtet sich daher nach der Struktur des oder der Monomeren bzw. Dimeren nach Formel III und nach dem Molekulargewicht des eingesetzten Poly(ethylenglycols). The reaction temperature is above the melting temperature of the educts used in each case and, therefore, depends on the structure of the monomer and dimer of formula III and on the molecular weight of the poly employed (ethylene glycol). Üblicherweise wird in einem Temperaturbereich zwischen 100 und 160 °C gearbeitet. Typically, C is carried out in a temperature range between 100 and 160 °. Bevorzugt ist ein Bereich zwischen 100 und 140 °C, besonders bevorzugt zwischen 110 und 130 °C. is preferably a range between 100 and 140 ° C, more preferably 110-130 ° C. Bei Polymeren, bei denen eine gute Löslichkeit in organischen Lösungsmitteln angestrebt wird, kann die Reaktionstemperatur auf 150 °C bis 170°C eingestellt werden. For polymers in which good solubility is sought in organic solvents, the reaction temperature can be set at 150 ° C to 170 ° C. Durch eine höhere Reaktionstemperatur wird eine gute statistische Verteilung der Comonomer-Einheiten im A-Block bzw. in den A-Blöcken begünstigt. A higher reaction temperature, a good statistical distribution of the comonomer units is favored in the A block, or in the A blocks. So können zB glycolidhaltige Polymere, die sich gut in Aceton lösen, hergestellt werden. Thus, for example glycolidhaltige polymers that are readily soluble in acetone, are produced. Die erforderlichen Reaktionszeiten richten sich nach der Reaktionsgeschwindigkeit des oder der eingesetzten Monomeren bzw. Dimeren nach Formel III, der Reaktionstemperatur und auch der nach Katalysatorkonzentration und liegen zwischen wenigen Stunden und mehreren Tagen. The reaction times required depend on the reaction rate of the monomer or dimer used according to formula III, the reaction temperature and the catalyst concentration and to lie between a few hours and several days. Bevorzugt ist eine Reaktionszeit zwischen 24 Stunden und 5 Tagen, besonders bevorzugt eine Zeit zwischen 2 und 5 Tagen. Preferred is a reaction time between 24 hours and 5 days, more preferably for a time between 2 and 5 days. Längere Reaktionszeiten bewirken in der Regel einen höheren Umsatz, was wiederum zu einer Reduktion der Konzentration der Edukte im Endprodukt beiträgt. Longer reaction times generally bring higher sales, which in turn contributes to a reduction in the concentration of the reactants in the final product. Zusammenfassend werden die relevanten Reaktionsparameter, nämlich Katalysatormenge, Reaktionstemperatur und -zeit in Abhängigkeit der eingesetzten Edukte unter den Aspekten möglichst geringer Katalysatorgehalt, gemäßigte Reaktionstemperatur zur Vermeidung von Zersetzungsreaktionen und Verfärbungen im Produkt und möglichst weitgehender Umsetzungsgrad der Monomeren bzw. Dimeren gewählt. In summary, the relevant reaction parameters, namely the amount of catalyst, reaction temperature and time depending on the starting materials used under the aspects of the lowest possible catalyst content, moderate reaction temperature to avoid decomposition reactions and discoloration in the product and as far as possible degree of conversion of the monomers or dimers can be selected. Im Regelfall wird das nach oben angegebener Beschreibung hergestellte Polymer noch einer Reinigungsoperation unterworfen. As a rule, the polymer produced according to the above indicated description nor a cleaning operation is subjected. Da die Ringöffnungspolymerisation der Edukte nach Formel III eine Gleichgewichtsreaktion darstellen, sind im Rohpolymeren noch Spuren an nicht umgesetzten Edukten enthalten, die bei der weiteren Verarbeitung und für die Implantation nachteilig sein können. Since the ring-opening polymerization of the starting materials of formula III represents an equilibrium reaction, are included in the raw polymers still contain traces of unreacted starting materials which may be disadvantageous for further processing and for implantation. Die Reinigung der Polymere kann durch Umfällung aus verschiedenen Lösungsmitteln oder durch Extraktion stattfinden. The purification of the polymers can take place by reprecipitation from different solvents or by extraction. Für die Umfällung wird das Rohpolymer in einem mit Fällungsmittel mischbaren Lösungsmittel gelöst, zB Aceton und die Lösung mit Wasser oder Methanol als Fällungsmittel gemischt. For the reprecipitation, the crude polymer is dissolved in a water-miscible precipitant solvent mixed as acetone and the solution with water or methanol as precipitant. Amorphe Polymere, welche sich nicht oder nur schwierig durch Extraktion reinigen lassen, werden häufig durch Umfällung gereinigt. Amorphous polymers only with difficulty can be cleaned by extraction, are often purified by reprecipitation. Bevorzugt ist ein Extraktionsverfahren. an extraction process is preferred. Dabei wird erhaltenes Rohpolymer mit einem Lösungsmittel extrahiert und anschließend getrocknet. Thereby obtained crude polymer is extracted with a solvent and then dried. Für das Reinigungsverfahren sind organische Lösungsmittel und überkritische oder druckverflüssigte Gase geeignet, die das jeweilige Monomer, nicht jedoch das Polymer lösen. organic solvents and supercritical or pressure-liquefied gases are suitable for the purification process but which do not dissolve the respective monomer, the polymer. Bevorzugt werden organische Lösungsmittel aus der Gruppe der n- oder cyclo-Alkane (c-Hexan oder n-Hexan bei Raumtemperatur) und Kohlendioxid, besonders bevorzugt ist überkritisches oder druckverflüssigtes Kohlendioxid verwendet. organic solvents from the group of n- or cyclo-alkanes (c-hexane or n-hexane at room temperature) and carbon dioxide are preferred, particularly preferred or supercritical carbon dioxide liquefied under pressure is used. Die resultierenden hochmolekularen Blockpolymere lassen sich durch thermoplastische Formgebungsverfahren in leichter Weise zu chirurgischen Implantaten verarbeiten, welche gegenüber den aus dem Stand der Technik bekannten Implantaten das gewünschte beschleunigte Abbauverhalten und trotzdem eine hohe initiale Festigkeit aufweisen. The resulting high molecular weight block polymers can be processed by thermoplastic shaping processes in an easy manner to surgical implants which have the desired accelerated degradation behavior and yet a high initial resistance to the processes known from the prior art implants. Die erfindungsgemäßen Implantate können beispielsweise für die Fixation von Hartgewebefrakturen (Osteosynthese), für die gesteuerte Geweberegeneration im Weichgewebe, für die Befestigung von Nahtfäden im Knochen (Nahtmaterialanker), als Wirbelsäulenimplantate zum Schutz der Bandscheibe (zB so genannte „spinal cages"), zum Verschließen und Verbinden von Blut- und anderen Gefäßen bei Gefäßrupturen (Anastomose), als Stents, zum Verfüllen von Kavitäten oder Löchern bei Gewebedefekten, beispielsweise im Dentalbereich oder bei Herzscheidewanddefekten oder auch zum Fixieren von Sehnen und Bändern im Knochen eingesetzt werden. Dafür werden die Blockpolymere zu Formkörpern verarbeitet, deren Gestalt an den entsprechenden Verwendungszweck angepasst ist. So sind zB Schrauben, Dübel, Platten Muttern, Anker, Vliese, Folien, Membran, Netze usw. zugänglich. Derartige Schrauben können beispielsweise in verschiedenen Dimensionierungen, mit verschiedenen Gewindeschneidungen, mit The implants according to the invention can, for example, for fixing of hard tissue fractures (osteosynthesis), for guided tissue regeneration in the soft tissue, for the attachment of sutures in the bone (suture anchor), as spinal implants to protect the disc (eg so-called "spinal cages"), for closing and joining of blood and other vessels in vascular ruptures (anastomosis), as a stent, for filling cavities or holes in tissue defects, for example in the dental field or cardiac septal defects or for fixing of tendons and ligaments are used in the bone. Therefore, the block polymers are to moldings processed whose shape is adapted to the respective purpose of use. for example, screws, anchors, plates, etc., are available nuts, anchor, non-wovens, foil, membrane networks. such screws may, for example, in different dimensions, with different Gewindeschneidungen, with Rechts- oder Linksgewinde und mit verschiedenen Schraubenköpfen, beispielsweise Kreuz- oder Einfachschlitz, ausgestaltet werden. Right- or left-hand thread and with different screw heads, for example, cross or single slot, are configured. Weitere Anwendungsmöglichkeiten können dem Stand der Technik entnommen werden. Other possible applications the prior art can be found. Die nachfolgenden Beispiele dienen exemplarisch der Illustration und sind lediglich als Möglichkeiten zu verstehen, ohne die Erfindung in Ihrem Inhalt einzuschränken. The following examples are exemplary of illustration only and are intended solely as ways to limit in your content without the invention. – Polymere vom AB-Typ mit mit L-Lactid als Baustein des A Blocks und 1 und 5 % Polytehylenglycol 2000 (PEG 2000) als B-Block. - copolymers of the AB type with an L-lactide as a component of the A block, and 1 and 5% Polytehylenglycol 2000 (PEG 2000) as B block. Die Zahlen 2000 bzw. 6000 geben die Molmasse des PEG in Dalton an. The numbers 2000 and 6000 indicate the molar mass of PEG in Daltons. Der für die inhärente Viskosität ermittelte Wert zum Zeitpunkt 0 wird auf 100 % normiert. The value obtained for the inherent viscosity at time 0 is normalized to 100%. Das entspricht dem Wert bevor der Prüfkörper in das Hydrolysebad eingetaucht worden ist. Corresponding to the value before the test specimen has been immersed in the hydrolysis bath. Um den Abbau zu bestimmen, werden die Messwerte in % bezugnehmend auf den Ausgangswert aufgetragen. To determine the breakdown, the measured values ​​in% are applied with reference to the initial value. Probe 1: L-Lactid-Polyethylenglycol mit einem Gewichtsanteil an Polyethylenglycol (PEG) von 1 % und einer Molmasse von 2000 Dalton. Sample 1: L-lactide, polyethylene glycol with a weight proportion of polyethylene glycol (PEG) of 1% and a molar mass of 2000 daltons. Die Länge des A-Blocks errechnet sich hierdurch auf 198000 Dalton. The length of the A block is calculated thereby to 198000 Daltons. Probe 2: L-Lactid-Polyethylenglycol mit einem Gewichtsanteil an Polyethylenglycol (PEG) von 5 % und einer Molmasse von 2000 Dalton. Sample 2: L-lactide, polyethylene glycol with a weight proportion of polyethylene glycol (PEG) of 5% and a molecular weight of 2000 Daltons. Die Länge des A-Blocks errechnet sich hierdurch auf 38000 Dalton. The length of the A block is calculated thereby to 38000 Dalton. Probe 3: L-Lactid-Polyethylenglycol-L-Lactid mit einem Gewichtsanteil an Polyethylenglycol (PEG) von 1 % und einer Molmasse von 6000 Dalton. Sample 3: L-lactide, polyethylene glycol-L-lactide with a proportion by weight of polyethylene glycol (PEG) of 1% and a molar mass of 6000 daltons. Die Länge der A-Blöcke errechnet sich hierdurch auf auf jeweils 297000 Dalton. The length of the A blocks is calculated to thereby respectively 297000 Dalton. Probe 4: L-Lactid-Polyethylenglycol-L-Lactid mit einem Gewichtsanteil an Polyethylenglycol (PEG) von 5 % und einer Molmasse von 6000 Dalton. Sample 4: L-lactide, polyethylene glycol-L-lactide with a proportion by weight of polyethylene glycol (PEG) of 5% and a molecular weight of 6000 daltons. Die Länge der A-Blöcke errechnet sich hierdurch auf jeweils 57000 Dalton. The length of the A blocks is calculated thereby to 57000 daltons, respectively. Probe 2: 38 %. Sample 2: 38%. Bei den ABA-Triblockcopolymeren führt der hydrolytische Abbau nach 18 Wochen, unabhängig ob 1 oder 5 % PEG gewählt worden sind, zu einer iV, die nur noch ca. 25 % des Ausgangswertes ausmacht. In the ABA triblock copolymers of the hydrolytic degradation results after 18 weeks, have been selected regardless of whether 1 or 5% PEG to an IV, which constitutes only about 25% of the initial value. Zum Vergleich: der Wert für Poly L-Lactid liegt nach 20 Wochen im Bereich von knapp 60%. For comparison, the value for poly L-lactide is after 20 weeks in the range of just under 60%. Zur Bestimmung der Zugfestigkeit werden Prüfkörper gemäß ASTM D 638 hergestellt und vermessen. To determine the tensile strength test specimen in accordance with ASTM D 638 are prepared and measured. Probe 5: L-Lactid-Polyethylenglycol-L-Lactid mit einem Gewichtsanteil an Polyethylenglycol (PEG) von 15 % und einer Molmasse von 6000 Dalton. Sample 5: L-lactide, polyethylene glycol-L-lactide with a proportion by weight of polyethylene glycol (PEG) of 15% and a molecular weight of 6000 daltons. Probe 6: L-Lactid-co-D,L-Lactid-Polyethylenglycol-L-Lactid-co-D,L-Lactid mit einem Gewichtsanteil an Polyethylenglycol (PEG) von 5 % und einer Molmasse von 2000 Dalton und einem Verhältnis von L-Lactid zu D,L-Lactid = 70:30. 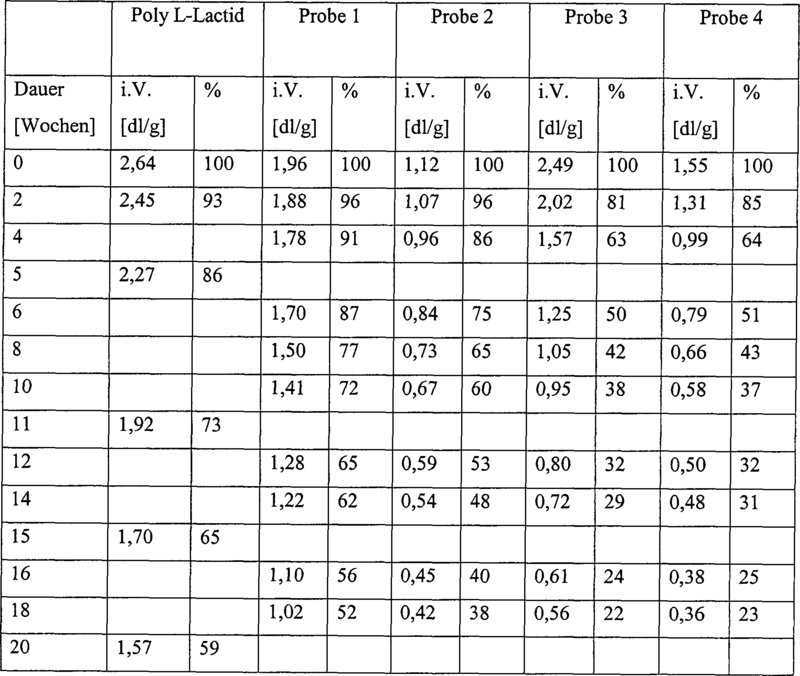 Sample 6: L-lactide-co-D, L-lactide, polyethylene glycol-L-lactide-co-D, L-lactide with a proportion by weight of polyethylene glycol (PEG) of 5% and a molar mass of 2000 daltons and a ratio of L lactide to D, L-lactide = 70:30. Probe 9: L-Lactid-co-Glycolid-Polyethylenglycol mit einem Gewichtsanteil an Polyethylenglycol (PEG) von 5 % und einer Molmasse von 5000 Dalton und einem Verhältnis von L-Lactid zu Glycolid = 85:15. Sample 9: L-lactide-co-glycolide, polyethylene glycol with a weight proportion of polyethylene glycol (PEG) of 5% and a molecular weight of 5000 daltons and a ratio of L-lactide to glycolide = 85:15. 35 g PEG 6000 (Polyethylenglycol mit einem Molgewicht von 6000 Dalton, zwei endständige OH-Gruppen) werden bei 85°C und 50 mbar/2 Stunden getrocknet. 35 g of PEG 6000 (polyethylene glycol with a molecular weight of 6000 Dalton, two terminal OH groups) are dried at 85 ° C and 50 mbar / 2 hours. Es werden 3,5 kg L-Lactid zugegeben. It 3.5 kg of L-lactide was added. Bei 112°C wird zu den geschmolzenen Edukten 965 mg Zinn(II) 2-ethylhexanoat zugegeben. At 112 ° C 965 mg of tin (II) 2-ethylhexanoate is added to the molten starting materials. Die Mischung wird bei 120°C 3 Tage lang in der Masse polymerisiert. The mixture is polymerized for 3 days in the mass at 120 ° C. Das entstandene Rohpolymer wird zerkleinert und mit den unten angegebenen Bedingungen extrahiert. The resulting crude polymer is ground and extracted with the conditions specified below. Das Polymer hat eine iV von 2,63 dl/g und eine Restmonomergehalt an Lactid von unter 0,5 %. The polymer has an IV of 2.63 dl / g and a residual monomer content of lactide of less than 0.5%. Der Gehalt an PEG im Copolymeren beträgt 0,9 % ( 1 H-NMR). The content of PEG in the copolymer is 0.9% (1 H-NMR). Dies entspricht einer auf das PEG 6000 bezogenen Molmasse des A Blocks von 338 000 g/mol je A-Block. This corresponds to a related to the molecular weight of the PEG 6000 A block of 338 000 g / mol depending A block. Die Glasübergangstemperatur (Tg) (über DSC Messung) liegt bei 60,8°C. The glass transition temperature (Tg) (by DSC measurement) is 60.8 ° C.
175 g PEG 2000 (Polyethylenglycol mit einem Molgewicht von 2000 Dalton, zwei endständige OH-Gruppen) werden bei 85°C und 50 mbar/2 Stunden getrocknet. 175 g PEG 2000 (polyethylene glycol having a molecular weight of 2000 Daltons, two terminal OH groups) are dried at 85 ° C and 50 mbar / 2 hours. Es werden 2520 g L-Lactid und 980 g D,L-Lactid zugegeben. There are 2520 g of L-lactide and 980 g of D, L-lactide was added. Bei 112°C wird zu den geschmolzenen Edukten 1003 mg Zinn(II) 2-ethylhexanoat zugegeben. At 112 ° C 1003 mg of tin (II) 2-ethylhexanoate is added to the molten starting materials. Die Mischung wird bei 120°C 3 Tage lang in der Masse polymerisiert. The mixture is polymerized for 3 days in the mass at 120 ° C. Das entstandene Rohpolymer wird zerkleinert und mit den unten angegebenen Bedingungen extrahiert. The resulting crude polymer is ground and extracted with the conditions specified below. Das Polymer hat eine iV von 0,86 dl/g und einen Restmonomergehalt an Lactid von unter 0,5 %. The polymer has an IV of 0.86 dl / g and a residual monomer content of lactide of less than 0.5%. Der Gehalt an PEG im Copolymeren beträgt 4,8%. The content of PEG in the copolymer is 4.8%. ( 1 H-NMR). (1H-NMR). 125 g PEG-MME 2000 (Polyethylenglycol mit einem Molgewicht von 2000 Dalton, einer endständigen OH-Gruppen und einer endständigen Methoxygruppe) werden bei 85°C und 50 mbar/2 Stunden getrocknet. 125 g PEG MME 2000 (polyethylene glycol having a molecular weight of 2000 Daltons, a terminal OH groups and a terminal methoxy group) are dried at 85 ° C and 50 mbar / 2 hours. Es werden 2135,2 g L-Lactid und 364,8 g Glycolid zugegeben. Are added 2135.2 g L-lactide and 364.8 g of glycolide. Bei 112°C wird zu den geschmolzenen Edukten 717 mg Zinn(II) 2-ethylhexanoat zugegeben. At 112 ° C 717 mg of tin (II) 2-ethylhexanoate is added to the molten starting materials. Die Mischung wird bei 150°C 3 Tage lang in der Masse polymerisiert. The mixture is polymerized for 3 days in the mass at 150 ° C. Das entstandene Rohpolymer wird zerkleinert und extrahiert. The resulting crude polymer is ground and extracted. Das Polymer hat eine iV von 1,7 dl/g und einen Restmonomergehalt von unter 0,5 %. The polymer has an IV of 1.7 dl / g and a residual monomer content of below 0.5%. Der Gehalt an PEG im Copolymeren beträgt 5,3 % ( 1 H-NMR). The content of PEG in the copolymer is 5.3% (1 H-NMR). 236,7 g PEG-MME 5000 (Polyethylenglycol mit einem Molgewicht von 5000 Dalton, einer endständigen OH-Gruppen und einer endständigen Methoxygruppe) werden bei 85°C und 50 mbar/2 Stunden getrocknet. 236.7 g PEG-MME 5000 (polyethylene glycol having a molecular weight of 5000 Daltons, a terminal OH groups and a terminal methoxy group) are dried at 85 ° C and 50 mbar / 2 hours. Es werden 2537 g D,L-Lactid und 1936 g Glycolid zugegeben. There are added 2,537 g of D, L-lactide and 1936 grams of glycolide. Bei 112°C wird zu den geschmolzenen Edukten 1293 mg Zinn(II) 2-ethylhexanoat zugegeben. At 112 ° C 1293 mg of tin (II) 2-ethylhexanoate is added to the molten starting materials. Die Mischung wird bei 150°C 3 Tage lang in der Masse polymerisiert. The mixture is polymerized for 3 days in the mass at 150 ° C. Das entstandene Rohpolymer wird durch lösen in Aceton und Fällung in Wasser gereinigt und anschließend getrocknet. The resulting crude polymer is purified by dissolution in acetone and precipitation in water and then dried. Das Polymer hat eine iV von 1,1 dl/g und einen Restmonomergehalt von unter 0,5 %. The polymer has an IV of 1.1 dl / g and a residual monomer content of below 0.5%. Der Gehalt an PEG im Copolymeren beträgt 4,9 % ( 1 H-NMR). The content of PEG in the copolymer is 4.9% (1 H-NMR). Dieses Reinigungsbeispiel lässt sich analog für andere Polymere durchführen. This purification example can be performed similarly for other polymers. Implantat bestehend aus einem Polyetherester als Werkstoff ausgewählt aus der Gruppe der AB- und ABA-Blockcopolymere mit A einem Polyesterblock und B einem Polyetherblock. Implant consisting of a polyetherester as a material selected from the group of AB and ABA block copolymers having a polyester block A and B a polyether block. Implantat nach Anspruch 1, dadurch gekennzeichnet, dass B ein Polyethylenglycol ist. Implant according to claim 1, characterized in that B is a polyethylene glycol. Implantat nach einem der Ansprüche 1 bis 4, dadurch gekennzeichnet, dass A aufgebaut ist aus Monomerbausteinen ausgewählt aus der Gruppe a) L-Lactid, b) D-Lactid, c) Gemische aus D- und L-Lactid, bevorzugt im Verhältnis 1:1, d) meso-Lactid, e) Glycolid, f) Trimethylencarbonat, g) epsilon-Caprolacton, h) Dioxanon, i) Gemische von L- und D,L-Lactid, j) Gemische von L-Lactid und Glycolid, k) Gemische von D,L-Lactid und Glycolid l) Gemische von L-Lactid oder D,L-Lactid und Trimethylencarbonat, m) Gemische von L-Lactid oder D,L-Lactid und epsilon-Caprolacton und n) Gemische von L-Lactid oder D,L-Lactid und Dioxanon. Implant according to one of claims 1 to 4, characterized in that A is composed of monomer units selected from the group a) L-lactide b) D-lactide, c) mixtures of D- and L-lactide, preferably in the ratio of 1: 1, d) meso-lactide, e) glycolide, f) trimethylene carbonate, g) epsilon-caprolactone, h) dioxanone, i) mixtures of L- and D, L-lactide, j) mixtures of L-lactide and glycolide, k ) mixtures of D, L-lactide and glycolide l) mixtures of L-lactide or D, L-lactide and trimethylene carbonate, m) mixtures of L-lactide or D, L-lactide and epsilon-caprolactone and n) mixtures of L- lactide or D, L-lactide, and dioxanone. Implantat nach einem der Ansprüche 1 bis 5, dadurch gekennzeichnet, dass die Kettenlänge des Blocks B im Mittel zwischen 500 und 10000 Dalton liegt und der gewichtsmäßige Anteil des B-Blocks zwischen 0,01 und 25 Gew.%, bevorzugt zwischen 0,01 und 20 Gew.%, stärker bevorzugt zwischen 0,1 und 15 Gew.%, stärker bevorzugt zwischen 0,1 und 10 Gew.%, stärker bevorzugt zwischen 0,1 und 5 Gew.%, stärker bevorzugt zwischen 0,1 und 4 Gew.% liegt. Implant according to one of claims 1 to 5, characterized in that the chain length of the block B is on average from 500 to 10,000 daltons and the percentage by weight of the B block is between 0.01 and 25 wt.%, Preferably between 0.01 and 20 wt.%, more preferably between 0.1 and 15 wt.%, more preferably between 0.1 and 10 wt.%, more preferably between 0.1 and 5 wt.%, more preferably between 0.1 and 4 wt .% lies. Implantat nach einem der Ansprüche 1 bis 6, dadurch gekennzeichnet, dass das Implantat ausschließlich aus einem Werkstoff gefertigt ist. Implant according to one of claims 1 to 6, characterized in that the implant is made entirely of one material. Implantat nach einem der Ansprüche 1 bis 7 zur Fixation von Hartgewebefrakturen, als Nahtmaterialanker, als Wirbelsäulenimplantat, zum Verschließen und Verbinden von Blut- und anderen Gefäßen, als Stent, zum Verfüllen von Kavitäten oder Löchern bei Gewebedefekten. Implant according to one of claims 1 to 7 for the fixation of fractures of hard tissue, as a suture anchor, as spinal implant for closing and joining of blood and other vessels, as a stent, for filling cavities or holes in tissue defects. Implantat nach einem der Ansprüche 1 bis 8 in Form einer Schrauben, eines Dübels, einer Platte, einer Mutter, einem Anker, einem Vlies, einer Folie, einer Membran, oder eines Netzes. Implant according to one of claims 1 to 8 in the form of a screw, a dowel, a plate, a nut, an anchor, a nonwoven fabric, a film, a membrane, or a network. Implantat gemäß einem der Ansprüche 1 bis 9, dadurch gekennzeichnet, dass es aus einem Material ist, welches als Formkörper gemäß ASTM D 638 eine initiale Zugfestigkeit von mindestens 70 MPa, bevorzugt 75 bis 95 MPa, besonders bevorzugt 80 bis 88 MPa und eine Abbaugeschwindigkeit gemessen durch Verlust der inhärenten Viskosität von größer 30 % nach 6 Wochen Hydrolysebad in einer wässrigen Phosphatpufferlösung mit einem pH von 7,4 bei 37°C aufweist. An implant according to one of claims 1 to 9, characterized in that it is made of a material which is measured as a molded body according to ASTM D 638, an initial tensile strength of at least 70 MPa, preferably 75 to 95 MPa, particularly preferably 80 to 88 MPa and a rate of degradation has by loss of the inherent viscosity of greater than 30% after 6 weeks of hydrolysis bath in an aqueous phosphate buffer solution having a pH of 7.4 at 37 ° C.
Implantat aus einem Material, welches als Formkörper gemäß ASTM D 638 eine initiale Zugfestigkeit von mindestens 70 MPa, bevorzugt 75 bis 95 MPa, besonders bevorzugt 80 bis 88 MPa und eine Abbaugeschwindigkeit gemessen durch Verlust der inhärenten Viskosität von größer 30 % nach 6 Wochen Hydrolysebad in einer wässrigen Phosphatpufferlösung mit einem pH von 7,4 bei 37°C aufweist. Implant made of a material which as a molded body according to ASTM D 638, an initial tensile strength of at least 70 MPa, preferably 75 to 95 MPa, particularly preferably 80 to 88 MPa and a rate of degradation as measured by loss of intrinsic viscosity of greater than 30% after 6 weeks of hydrolysis bath in comprises an aqueous phosphate buffer solution having a pH of 7.4 at 37 ° C.
Blockcopolymer vom AB- oder ABA-Typ gemäß einem der Polyetherester nach einem der Ansprüche 2 bis 7. Block copolymer of the AB or ABA type of a polyetherester according to any one of claims 2 to 7 in accordance with. Blockpolymer nach Anspruch 12, dadurch gekennzeichnet, dass A aufgebaut ist aus einem Gemisch von Monomerbausteinen ausgewählt aus der Gruppe a) D- und L-Lactid, bevorzugt im Verhältnis 1:1, b) L-Lactid und Glycolid, c) D,L-Lactid und Glycolid, c) L-Lactid und epsilon-Caprolacton, d) L-Lactid und Dioxanon, e) L-Lactid und Trimethylencarbonat. Block polymer according to claim 12, characterized in that A is composed is made from a mixture of monomer selected from the group a) D- and L-lactide, preferably in the ratio 1: 1, b) L-lactide and glycolide, c) D, L lactide and glycolide, c) L-lactide and epsilon-caprolactone, d) L-lactide, and dioxanone, e) L-lactide and trimethylene carbonate. Blockpolymer nach einem der Ansprüche 12 oder 13, dadurch gekennzeichnet, dass der Gewichtsanteil des B-Blocks zwischen 0.1 und 4 Gew.% beträgt. Block polymer according to any one of claims of 12 or 13, characterized in that the weight fraction of B block is between 0.1 and 4 wt.%. Blockcopolymer gemäß einem der Ansprüche 12 bis 14, dadurch gekennzeichnet, dass der Gewichtsanteil des B-Blocks zwischen 1 und 3 Gew.% liegt. is block copolymer according to any one of claims 12 to 14, characterized in that the weight fraction of B block is between 1 and 3 wt.%. Verfahren zur Reinigung von mit Monomeren verunreinigten Blockcopolymeren gemäß einem Polyetherester nach Anspruch 1 oder einem Polyetherester nach einem der Ansprüche 12 bis 15, dadurch gekennzeichnet, dass das Rohpolymer mit einem Lösungsmittel aus der Gruppe der n- oder cyclo-Alkane oder mit Kohlendioxid, bevorzugt mit Kohlendioxid extrahiert wird. A process for purifying contaminated monomers block copolymers according to a polyether ester as claimed in claim 1 or a polyetherester according to any one of claims 12 to 15, characterized in that the crude polymer with a solvent from the group of n- or cyclo-alkanes or with carbon dioxide, preferably with carbon dioxide is extracted. Verwendung von Blockcopolymeren gemäß einem Polyetherester nach Anspruch 1 oder einem Polyetherester nach einem der Ansprüche 12 bis 15 zur Herstellung eines medizinischen oder chirurgischen Implantats. Use of block copolymers according to a polyether ester as claimed in claim 1 or a polyetherester according to any one of claims 12 to 15 for the manufacture of a medical or surgical implant. Verwendung von Blockcopolymeren nach Anspruch 17 zur Herstellung eines Implantats für pädiatrische Indikationen. Use of block copolymers according to claim 17 for producing an implant for pediatric indications. MX2007016263A MX2007016263A (en) 2005-07-15 2006-07-12 Resorbable polyether esters for producing medical implants. ES06764137T ES2375637T3 (en) 2005-07-15 2006-07-12 Poly (ether-esters) resorbable and their use for the production of medical implants. ES2338820T3 (en) 2006-03-09 2010-05-12 Coloplast A/S Copolymers with improved degradable for soft tissue regeneration biocompatibility hydrophilic block. Vert et al. 1998 Something new in the field of PLA/GA bioresorbable polymers?